Announcement of an upcoming conference on CHWs and the SDGs. Makerere University College of Health Sciences, School of Public Health, Uganda in partnership with Nottingham Trent University, UK and Ministry of Health, Uganda have organised a symposium with the theme: Contribution of Community Health Workers (CHWs) in attainment of the Sustainable Development Goals (SDGs) to be held from 21st to 23rd February 2017 in Kampala, Uganda. This 3-day symposium will bring together academics, researchers, practitioners, funders, policy makers, implementers, students, media and other stakeholders from Uganda, other countries in Africa, and beyond. The event will be interdisciplinary and inclusive to both those working in the health and development fields in order to fully explore the themes and discussions about the value, importance and contribution of CHWs to the SDG agenda globally. 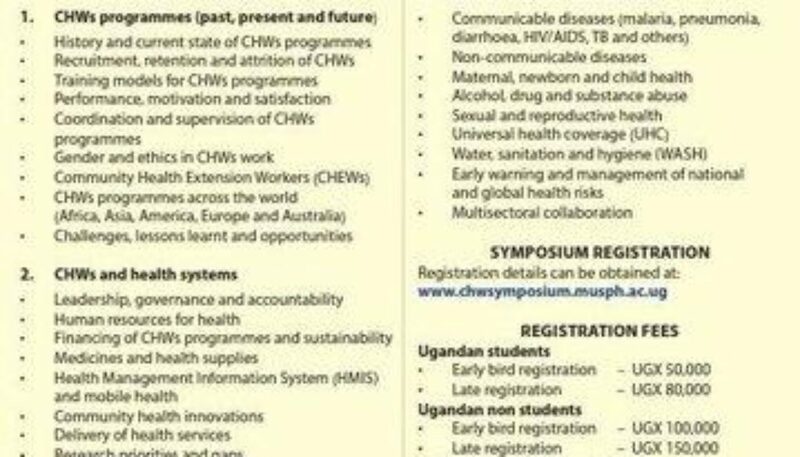 The symposium will bring together a diverse range of health and development professionals including those working with, and have interest in the work of CHWs. Over 300 participants from across the world are expected to participate in the event. Several entities including universities, research institutions, non-governmental organisations (NGOs), civil society and local governments have done tremendous work with CHWs who will be showcasing their outputs and experiences. Among the sub themes of the symposium is ‘Gender and ethics in CHWs work’ which will explore issues of gender that relate to the work of CHWs as well as ethical aspects in practice. Specifically, subjects such gender policies in selection of CHWs, gender composition of CHWs, ethical guidelines for CHWs work, and CHWs experiences regarding gender and ethics will be explored. More information about the symposium including submission of abstracts can be accessed on the symposium website. Gender and Men’s Health: Changing the Discourse	Power and prejudice: How does inequity play out in the institutions and processes of health systems research?